White bread is made by removing the wheat berry’s germ and bran (where all the nutrients are) and grinding the endosperm into flour. Whole wheat bread leaves the germ and the bran and grinds the whole wheat berry into flour. Sprouted bread is made from wheat berries that are first allowed to sprout. Grains are actually seeds. A seed doesn’t want to sprout in an unfriendly environment, like when it’s dry and cold, or it will die. So seeds have enzyme inhibiters that prevent them from sprouting until the environment is just right. When seeds get warm and wet, like in the spring, the enzyme inhibitors are disabled and the seeds can start to germinate. Seeds also don’t want to be eaten. So they have developed anti-nutrients to discourage animals from eating them. These anti-nutrients can prevent the absorption of nutrients and inhibit digestive enzymes, among other things. Cooking can eliminate many anti-nutrients but not all of them. Increases the amount of available healthy nutrients. Sprouting can increase the amount of the amino acid lysine, increase protein quality, increase soluble fiber, folate, vitamin C, vitamin E, and beta carotene availability, and decrease the amount of carbohydrate. Reduces the amount of harmful anti-nutrients. 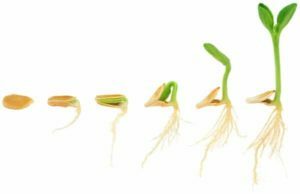 Sprouting can decrease anti-nutrients like phytic acid, which can bind minerals like zinc, calcium, magnesium, and iron and prevent them from being absorbed. Sprouting can also inactivate some enzyme inhibitors, which can make some nutrients less available for absorption. Makes gluten and other proteins more digestible. Sprouting helps to predigest gluten and other proteins to make it easier on your digestive tract to break down and absorb. Sprouting can increase the fiber content of the seed, which can help us push waste and toxins out of the gut and regulate bowel movements. So when you’re shopping for bread, look for sprouted bread- it’s usually refrigerated. And if it’s not available, always choose the freshest bread, with the least amount of preservatives you can find. Sourdough and whole wheat are usually good options.